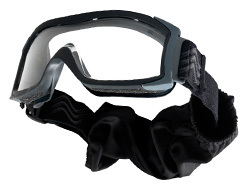 The x1000 are the latest ballistic goggles on the market and include all the latest features. Silicone strips help the strap cling to your helmet and a quick-release design will allow you to remove them from your face in a hurry should they become damaged or dirty. They are specifically designed to be compatible with a helmet without standing off your face but equally suited to wearing without. The frame is made from heat resistant TPV so it will not distort when working in the dessert or other high-temperature environments. Ventilation, along with a special lens treatment, will also help prevent the goggles from misting. We have three types of the x1000. Please use the drop down menu above to switch between them. The standard version uses a single lens. 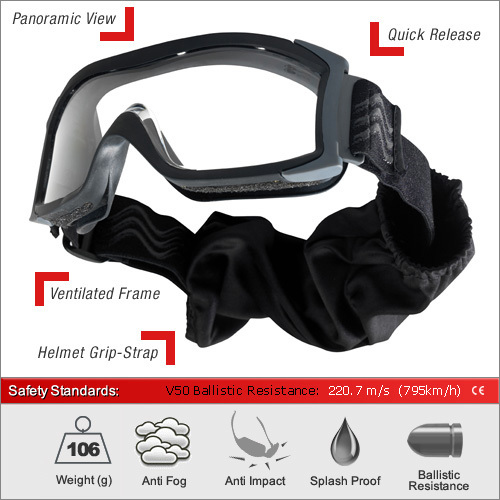 The dual lens type has additional anti-mist properties and an increased ballistic resistance of 990km/h, the highest of any tactical goggle. The dual lens also has ultra-violet protection. The RX version has a special lens which can sit over the top of existing prescription glasses. Note that due its shape, the RX is only a single lens. It is important that you take good care of your ballistic goggles and so each pair is supplied with a micro-fibre pouch fitted to the strap, enabling you to apply it quickly whilst still fitted to your helmet. A rigid carry case is also supplied for you to store them safely within a pack. All our ballistic goggles are certified to STANAG 2920, the official NATO Military Agency for Standardization (MAS) ballistic test method for personal armour materials and combat clothing. Here we have also summarised the main European safety standards for the frame and each lens type. After each are their specific safety markings (i.e. 2-1.2 1F). To interpret these and understand the full specifications of each pair, please see our dedicated Standards Advice Section.